Hindutva Fascism, The New Normal in India? Home » Int'l Affairs » Hindutva Fascism, The New Normal in India? Written by: Shafqat Javed on June 5, 2017. A person who has even a slight inkling about political culture in India knows that real right-wing tyranny has been taking over the country since Narendra Modi’s inauguration as country’s Prime Minister in 2014. The burgeoning bureaucracies, endless corruption and the rampant nature of identity politics are dissuading reasonable Indians from running for public offices, leaving the posts empty for those who are willing, and capable of, exploiting the ordinary Indian and for those who want to spread their extremist Hindutva ideology. Astonishing was to note the blatant discrimination, prejudice and bigotry on the part of Bharatiya Janata Party (BJP) as while a range of criminals got BJP tickets in Uttar Pradesh, the party could not find a single Muslim candidate to put up. This is marginalization of minorities and an utter negation of their rights. It is all because of the Hindutva ideology that is, at present, fast seeping into India’s national consciousness. Modi’s lifelong association with Hindu terrorist outfit Rashtriya Swayamsevak Sangh (RSS) speaks volumes about this fact. RSS, with its avowed goal of a Hindu rashtra, or a Hindu nation, and Modi’s BJP, which is an offshoot of the RSS, have always had a fascination for the likes of Benito Mussolini and Adolf Hitler. Since Modi’s ascension to power, there has been a slow but steady resurgence of a potent variant of Hindu nationalism that is corrosive not only to Indian nationalism but also to the basic human rights, such as the right of free expression. 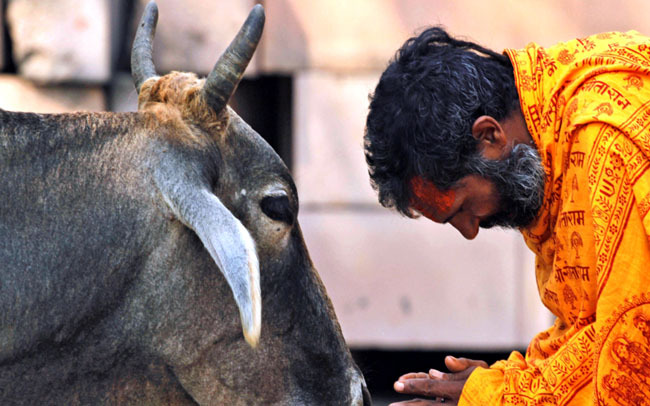 The past three years have seen far-right Hindu groups organizing campaigns to convert Muslims and Christians to Hindus and calling for a nationwide beef ban to be enforced for the reason that the cow is a sacred animal for Hindus. This is a flagrant violation of the principles of secularism India has always boasted of. India’s democratic fortunes, which are already under threat, have taken another decisive turn to the right with the results of recent state assembly elections. Modi’s BJP made significant gains in four crucial states: Uttarakhand, Goa, Manipur and, most significantly, Uttar Pradesh (UP) — India’s most populous state. Owing to the personalized nature of Indian politics, this BJP victory is being, overwhelmingly, seen as for Narendra Modi only. More rightly, this is the “New India” and all Indians are now part of ‘Modi’s nation’ rather than an Indian nation. But, as political philosophers assert, a nation does not belong to one man, but a people who have elected him, and importantly also, to those who did not. Democracy is not reducible to a formulation that the majority wins, but its highest ideals enshrine safeguarding its minorities. If anything Modi’s India represents is a profound crisis for secularism; supposedly, the essence of the country’s constitutional values. The BJP’s choice of Yogi Adityanath represents another grotesque subversion of these principles. BJP’s resounding victory in Uttar Pradesh and the subsequent foisting of Yogi, who is avowedly against Muslims and other non-Hindu populations, as the chief minister on it, is an evidence to the fact that under Narendra Modi, India is fast moving toward becoming a fascist state. In making the choice of Yogi, Modi has made a telling declaration of intent both for the general elections of 2019 and for concerning the reconstitution of the Indian Republic generally. Modi has made it very clear that the log-in for India in the coming days will be “development” but the password is to be “Hindutva”. The contemporary historical moment is that of a post-colonial state, an independent nation, and the conflict is over the immense change in power relations it entails. The conflict is dressed up in the clothes of religion and the slogan is that the preeminence of Hindutva has to be established. The 2014 elevation of Narendra Modi to the highest seat of power had already signalled these shifts. Representing the rise of cultural-religious chauvinism backed by corporate power, and a general public willingness to disregard communal violence for the promise of ‘development’, the BJP mandate might well indicate the contours of a ‘new, fascist India’. But this is a process that has been patiently engineered through the decades. The BJP, powered as it is by the radical RSS, has been making its long march through the institutions, belying the claim that once parties come to power they automatically shift to the liberal centre. India is now the main focus of the BJP and its electoral victories and the growing Hindutva. In fact, there should never have been any doubt about this. The BJP’s core voter strength and identification is Hindutva. It is a public embrace and effective dispensation of Hindutva that made Narendra Modi the Chief Minister of Gujarat several times over. And Hindutva is why Modi and the BJP won in 2014, although his motto was development for all. Yes, there were people who truly believed the promises of “development” that they had been waiting for the last 70 years. Some of these unfortunates were voters. Some of these even more unfortunates belonged to India’s religious minorities, who were tired of the status quo, of being “appeased” and of their religious leaders being given prominence over their own hopes and aspirations. Modi was going to deliver. India was going to look like all those photoshopped images of Gujarat that every gullible hopeful voter swallowed up. No matter if the pictures were of Singapore or San Francisco. What development did India get? India is still reprising old UPA bills and acts and ideas, from the National Rural Employment Guarantee to the General Services Tax to the unique identity number mission. All these schemes were fought tooth and nail by the BJP and no less by Modi himself when he was the Chief Minister of Gujarat. Now, they have been repackaged and re-calibrated to become BJP ideas. And worse, the unique identity number is being enforced in insidious ways. The other promise was “maximum governance, minimum government”. But whatever one may think about the overnight demonetisation of 86 percent of Indian currency, one ought to be able to see that it has increased the power of the government and the banks over the Indian public. And more, recently, the Finance Bill sneaked through Parliament as a “money bill”, without debate. That’s all government and no governance. The BJP thugs came to power by exploiting religion and by promoting anti-Pakistan and Hindutva ideologies. While campaigning, BJP president Amit Shah bombastically declared during the Bihar state elections that if the BJP lost, “Pakistan would celebrate Diwali”. In UP, he made sure that the BJP would not lose. The agenda was set when the Prime Minister thundered about how UP needed more cremation grounds not more graveyards for Muslims, and Hindus should get more electricity during Diwali than Muslims get during Ramadhan. Truth has nothing to do with election campaigns and yet, there may be a chilling message in Modi’s words. By picking a rabid, anti-Muslim, anti-non-Hindu Yogi as the Chief Minister of UP, Modi and Shah have stopped hiding behind “development”. It is as it always was: Hindutva. The first targets have been Muslims – butchers, meat-exporters. The next target has been men and women who do not fit in with Hindutva’s ideas of morality and how men and women should behave. Free rein has been given to vigilantes and core Hindutva groups on the pretext of “protecting women”. Many assumed that the huge mandate for Modi in UP would lead the BJP to really establish itself as a national party beyond the narrow, divisive, petulant demands of Hindutva. But between the assumption and the reality falls the shadow, as TS Eliot put it. For the BJP, the way forward till 2019 and beyond is clearly Hindutva. The “masks” – as an RSS ideologue had evocatively put it decades ago – have all fallen away. Renowned lawyer Fali Nariman has chillingly warned that Indians cannot depend on the courts to save the idea of India as a democratic republic. The onus then falls on civil society to stop India from becoming a Hindutva fascist state. Authoritarian politics, including fascism, does not grow out of one evil individual with inexplicable power. Authoritarianism grows out of consistent work by groups of people (who could well be in the minority, at first) gaining power by stoking the flames of fear and hatred, scapegoating vulnerable minorities, offering alienated young men a sense of power and using fear as a tool to silence people into submission. As Hannah Arendt stressed in her 1951 book “The Origins of Totalitarianism,” totalitarianism grows out of reactionary movement. It is at its most dangerous when it is a popular project. In India, the goons of BJP from their military wing of RSS routinely break up meetings and discussions that do not fit their fascist vision of India. This has included breaking up discussions at universities and harassing left-wing students and academics that are critical of the fascist regime in India. in spite of all government patronage of fascism, let it be very clear, this ‘new normal’ in India cannot endure for long.